Our mission at Hollywood Storage Center of Thousand Oaks in Newbury Park, CA, is to make self-storage affordable, easy, and (yes, we’ll say it) FUN. When you call or visit, our friendly and knowledgeable storage unit consultants will Beat All Deals in the Conejo Valley – seriously, you won’t do better or feel happier with any other storage facility from Newbury Park to Calabasas. Not sure how much space you need? Use our Storage Calculator. 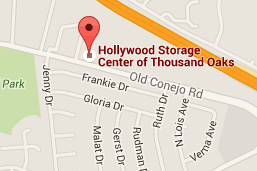 Hollywood Storage Center of Thousand Oaks is proud to serve a number of communities in our nearby area. The lion’s share of renters at Hollywood Storage Center come from our home town of Newbury Park. Many Newbury Park residents know of Hollywood Storage because of our ties with the community. We proudly support groups such as the Newbury Park High School band program with bottled water donations throughout the year. With our location on the often-traveled corridor of Old Conejo Road between Wendy Drive and Reino Road, our facility is well recognized among locals. Hollywood Storage serves a large number of Thousand Oaks residents. Whether coming from the more business-centered areas of TO, such as the Thousand Oaks Boulevard corridor where you find the Thousand Oaks Civic Arts Plaza, or the residential section of town near Los Robles Hospital and Thousand Oaks High School, it’s just a short drive on the 101 freeway to the Wendy Drive exit, or head west a couple of miles on Hillcrest Drive, taking a left at Target and heading over the 101 to Old Conejo Road. Westlake Village is situated just east of Hollywood Storage Center. Locals in this area realize a short drive provides substantial savings on self storage. Many of our Westlake Village customers love our climate-controlled wine storage and safely store a wide range of their belongings with us. From Westlake Golf Course or The Promenade at Westlake, our customers hop on the 101 freeway and exit on Wendy Drive to get to Hollywood Storage Center. Many residents of Camarillo spend a good amount of time in our area. Some bring their kids over the grade to attend the excellent schools. Others visit the recreational areas on a frequent basis. Our Camarillo customers really love the convenience of our post office, which allows them to take care of their shipping needs easily while they’re in our area. Getting to Hollywood Storage from Camarillo is a snap. From the Camarillo Premium Outlets, take Las Posas Road north to hop on the 101 east. Exit on Wendy Drive and make a left to find us on Old Conejo Road! Marking the easternmost portion of the Conejo Valley is another community Hollywood Storage serves—Agoura Hills. This beautiful area has very few storage facility options, so to get storage needs met, Agoura Hills residents have the choice of either fighting their way east on the 101 toward Los Angeles, or heading west into the quieter, and more temperate climate of Ventura County. From the well-known music venue The Canyon Club, Agoura Hills locals hop on Kanan Road to access the 101 freeway heading west. Exit on Wendy Drive and make a left to find us on Old Conejo Road. Though Calabasas is part of Los Angeles County, Hollywood Storage Center receives customers from this area because of our convenient location off the freeway and the offer we extend to provide a free truck and driver to make move-in a breeze. Calabasas residents really appreciate our VIP services, and no wonder since celebrities like Justin Bieber, Selena Gomes, Jessica Simpson and the Kardashians have all called Calabasas home. Whether coming from the Sagebrush Cantina off Valley Circle Drive or one of the beautiful recreation sites such as Malibu Creek State Park, it’s an easy drive to Hollywood Storage Center. Calabasas residents simply hop on the 101 freeway and head west, exiting on Wendy Drive in Newbury Park. World famous for its beautiful beaches and celebrity estates, Malibu is home to several Hollywood Storage Center tenants. Drive Pacific Coast Highway through Malibu and it’s likely you’ll never see a storage facility. This shortage is why Malibu residents find their way to us. Many of our Malibu customers appreciate our extra-large facility with the most choices in unit sizes, and they also like the option of having a safety deposit box at Hollywood Storage where they can safely store important items. The drive from Malibu to Hollywood Storage is a scenic pleasure too. From Pepperdine University, head west on State Route 1, and turn right on Kanan Dume Rd. Drive through the canyon until you reach the 101 freeway, then head west and exit on Wendy Drive in Newbury Park. Sunday 8:30 a.m. to 6 p.m.
Mon-Sat 8:30 a.m. to 6 p.m. Things to do in Thousand Oaks – Why Our Storage Unit Experts Love T.O.